(Photo: REUTERS / Carlos Eduardo Ramirez)Opposition supporters hold a national a flag during a rally against Nicolas Maduro's government in San Cristobal March 22, 2014. Two Venezuelans died from gunshot wounds during protests against Maduro, witnesses and local media said on Saturday, pushing the death toll from almost two months of anti-government protests to 33. The Vatican says it is prepared to act as a mediator in the Venezuelan conflict where the government has faced weeks of opposition-led street protest. At least 36 people have died this year as a result of the often violent protests. Venezuelan President Nicolas Maduro has accepted the idea of a "mediator in good faith", due to the increasing pressure to negotiate with the opposition, the Catholic Fides news agency reported Saturday. On March 27, Maduro mentioned the name of Vatican Secretary of State, Cardinal Pietro Parolin who, until last year, was apostolic nuncio in Caracas. Fides Agency quoted Vatican spokesman Father Federico Lombardi as saying, "Speaking of the situation in Venezuela and a possible role of cardinal Parolin, the Holy See - and also personally Cardinal Secretary of State Parolin, who knows and loves Venezuela since he was Nuncio - is certainly willing and eager to help the country. "However, it is necessary to deepen and have more elements to better see what the expectations are and if there are preconditions to achieve the desired purpose." The opposition has accused Maduro's government of creating a situation that has triggered food shortages and violations of freedom of speech. For his part Maduro and officials have blamed the opposition for threatening Venezuelan security and exacerbating economic problems. On Friday Reuters news agency reported that Brazil has toned down its support for stemming from disappointment over his handling mounting o economic problems and the street protests. The World Council of Churches president for Latin America and the Caribbean, Rev. Gloria Nohemy Ulloa Alvarado, had on March 10 expressed concern over the violence. Responding to an appeal for peace made in a letter by the Presbyterian Church of Venezuela, Ulloa said, "We join in prayers with our brothers and sisters from the Presbyterian Church in Venezuela." She supported a letter drafted by the delegates of the 34th General Council of the Presbyterian Church of Venezuela. The letter emphasizes that "violence and death can bring only more violence and death." The letter stated that killings and conflict are not the way toward development in Venezuela, and it warns of the risk of sinking into ""mindless fratricidal confrontation that benefits no one." 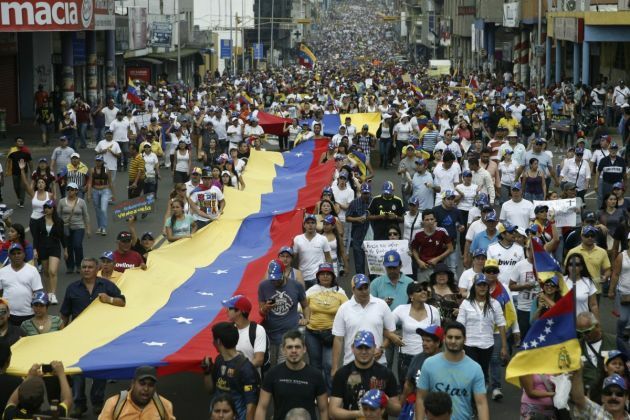 The Latin American Council of Churches (CLAI) has also encouraged Venezuelan churches to continue their work and prayers for peace, whilst it condemed""the illegal and anti-democratic intentions of the opposition in Venezuela to bring about regime change using violence."